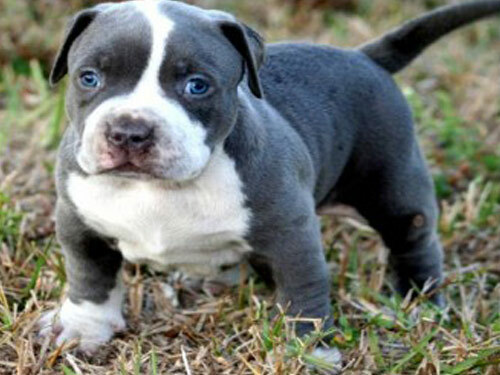 Originating during the 19th century, the American Pit Bull Terrier was noted for having the gameness of a Terrier and the athletic abilities and strength of a Bulldog. This breeds versatile talents made them a favorite of farmers and ranchers for such uses as protection, livestock driving, family companions, and as catch dogs for hogs and semi-wild cattle. The American Pit Bull Terrier is solidly built, medium in size, muscular, and powerful. Frequently referred to as great warriors, this breed exhibits strength, courage, agility, and grace. They have an exceptionally gentle disposition with those they love. This breed is extremely loyal, deeply devoted, affectionate, intelligent, and good-natured. The American Pit Bull Terrier does best in a home with older considerate children. They will get along with other dogs they have been raised with but may exhibit aggression toward strange dogs and other small household pets. They are exceedingly protective of their family, home, and territory. American Pit Bull Terriers are not generally used for guarding due to their friendly nature. Aggressive behavior toward humans is an uncharacteristic trait in this breed. They are not recommended for the novice, apathetic, or sedentary owner. The American Pit Bull Terrier has a glossy, short, smooth coat that is stiff to the touch. The coat comes in a variety of colors, combination of colors, or color patterns. This breed is an average shedder. The American Pit Bull Terrier is very obedient and eager to please. Intensive and extensive early socialization and obedience training are absolutely crucial for this breed. They will not respond to harsh or heavy-handed methods. Training should be done with respect, praise, firmness, fairness, patience, and consistency. They display talents in such performance areas as agility, tracking, conformation, weight pull, and obedience. This breed requires a high degree of exercise to keep them happy. They enjoy securely leashed walks, hiking, and mountain-biking. The American Pit Bull Terrier thrives on human interaction and benefits from family play sessions such as Frisbee and playing ball. They will do okay in an apartment dwelling provided they are given sufficient exercise, attention, and stimulation.